On Sunday I left London to go to Peru for a business trip. I was connecting in Madrid but, due to a 4-hour delay in the departure of the flight, I missed my red-eye connection to Lima. Fortunately, European Union regulations mandate that airlines feed and provide shelter to stranded passengers (subject to some conditions), unlike in the USA, where the same unfortunate circumstance is usually the passengers’ problem. So Iberia gave me a voucher for a dinner, a breakfast, a hotel night in a nearby hotel, two phone calls and the transfer to and from the hotel. I was also rebooked on the next flight… 12 hours later. That meant missing my first scheduled customer appointment, which I asked my Peruvian distributor to re-schedule for me. 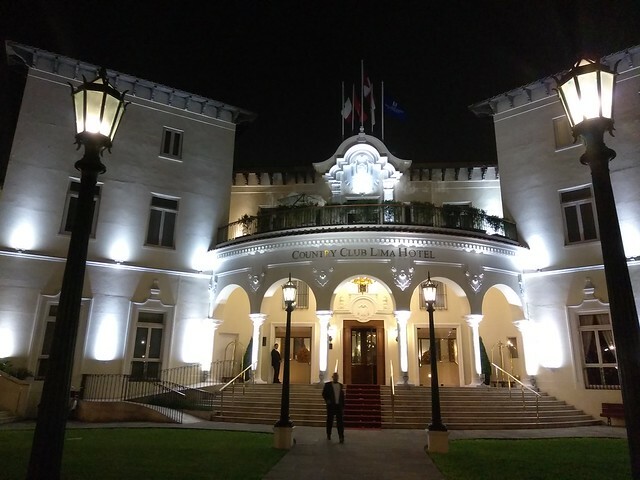 Upon arrival in Lima, I went straight to my hotel, the Country Club Lima, where I held my first business meeting. During dinner. It’s never a good idea to go straight to a business meeting after a 13-hour flight, but in this case, there was no choice. I went to bed quite convinced that I would sleep the many hours my body was asking for. Long dark curtains, perfectly comfy and huge bed, all kinds of pillows to choose from… I was in sleep heaven. But, 6 hours later, well ahead of my wake-up call, I woke up and decided to get to work. The hotel’s great wifi made it a pleasure working from the hotel (which is quite rarely the case). Four hours later, I went downstairs to have breakfast. I must admit the breakfast buffet was quite disappointing for such an upscale hotel, but the terrace table and perfect temperature made up for it. I held my second meeting (about business in Colombia) while having breakfast, and my third (with my new distributor in Peru). Right after that meeting, I went straight to the airport without having had any lunch, so before I boarded y flight to Madrid, I used my last few remaining Peruvian Soles to have an artichoke quiche and freshly squeezed cherimoya juice. The flight went quite well. I love it when I can sleep for a few hours on a plane stretching my long legs, and then I work with my laptop, without any distraction, full concentration for hours. After almost missing the quick layover in Madrid, due to the late arrival of the plane, which forced me to run the 2000 meters obstacle course in record time, I took a flight to London. Upon arrival in London, I went straight to my office to meet a Spanish expert in Machine Learning and Big Data, and long time friend, Juanto, who came to London’s Google Campus to give a lecture. I missed most of his lecture, but at least we had a chance to talk and catch up. He was there with his brother and his son, and we laughed talking about how more than a decade ago we went to Switzerland to meet VCs to finance our planned startup for an online video and streaming platform. For reference, YouTube was founded in 2005 and Twitch in 2011. “Too early” they said. Like when I told my dad I needed his support to set up an “Internet Index” in 1994. “WFT?” he said. Yahoo was founded in 1995. Anyway, by the time I got home my poor neglected body was telling me in its obscure language “someday you will pay for this, buddy”. I laughed, not because I don’t believe it or I don’t care, but because my body called me buddy. I know, I’m weird. Time to go to sleep.